Large in size at almost 375 pages, Alone is a much faster read than it looks sitting on a bookshelf. 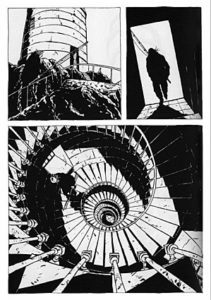 Christophe Chaboute’s masterpiece is filled with massive panels in simple black and white that heavily rely upon blank space and high contrast with lots of heavy black inking. The premise is simple. Man, born at a lighthouse, left there because his parents were ashamed of his facial deformity. His mother and father pass, but before they die, they left a large sum of money to fishermen to deliver supplies to the man they call “Alone.” No one has seen him or heard from him in years, but the supplies disappear, so our fishermen assume that “Alone” is alive and collecting the supplies. And they would be correct, leaving the fishermen, as well as the reader to wonder…what does one do with all of that time, alone, in a lighthouse day after day. The answer is simple: you toss a dictionary into the air, let it hit a desk, point to a word, and imagine what that would look like in the outside world. A world that Alone has never seen or experienced. One of the fishermen slips a note to Alone in one of his delivery packages, asking him if he would like anything special on the next delivery. He replies with “Images of the outside world.” Something so simple. However, this simple request ultimately plays a huge factor in the third act of the story, and it was this request that inspired me to think of ways to use this story in my classroom. And while I will use it primarily in my graphic novel class, I can see this activity being used in any classroom. I will simply give my students the prompt that Alone gives the fisherman: Images of the outside world. I will ask my students for five images of the outside world, nothing else. We will analyze what the images they select say about their world view and their connection to society as a whole. I think a lot can be said about the five images one chooses to represent the “outside world.” I’m still working on the process, assessment, and discussion, but there is something here. In this visual world, allowing students to dictate what that world means. Maybe using those images as a start to a short comic that informs their world? The possibilities are endless. This is a massive book to order a class set of, but a few copies might go a long way. Like I said, it’s not a long read. But this book could be a great classroom tool for you. 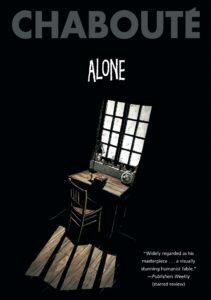 I listed the age as 13+, but that’s only because of the book’s cerebral nature. I won’t ruin the story for you by telling you exactly how it ends, but I will say that it is beautiful, thought-provoking, and heart-breaking.